Lemon Honey JewelryTM is a boutique bridal gifts & jewelry brand that encourages the pursuit of effortless personal style. We are dedicated to curating beautifully fun fashion jewelry & bridal gifts at affordable prices. ■ Our fabulous jewelry is expertly made using high-quality brass plated in your choice 14k Gold, Rose Gold or Sterling Silver. Our process guarantees longevity over lower quality brands. ■ Each bracelet includes our signature 3.5" x3.5"x1" white glossy cotton filled gift-box with a fun gold glitter heart on top. ■ We've already found the words! Our thoughtful note cards are included with each order in Black text. THOUGHTFUL & BEAUTIFUL! - The Tie The Knot Bracelet is the perfect way to ask or thank your bridal party in a stylish & thoughtful way. MADE WITH HIGH QUALITY MATERIALS - Our bangles are made with the finest craftsmanship. Each bracelet is made with an adjustable band and durable wire that is stronger than similar designs on the market. They won't bend out shape easily! TIME SAVING & GIFT READY - This time saving; gift ready option is loved by busy brides. 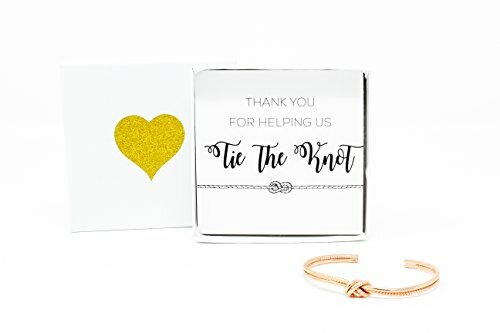 Each bracelet includes a 3.5" x 3.5" x 1 " white glossy cotton filled gift box AND a pre-written notecard with the words "Thank You for Helping Us Tie the Knot" in Black text. THE LEMON HONEY JEWELRY PROMISE - Compare our knot bracelet to ANY of our competitors and you will see how fabulously we do business.